Travel Guide: Prairie art at its best! The raw, unspoiled beauty of the prairie landscape has inspired artists since man first came to this land. 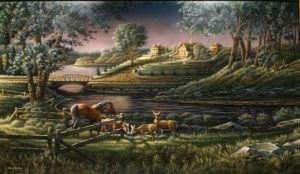 One of the finest artists to capture scenes of prairie life in the last century, however, was Terry Redlin. 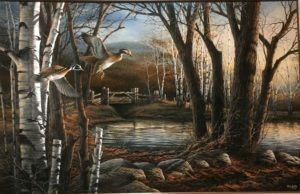 Mr. Redlin, who died in 2016, was once named “America’s Most Popular Artist” by US Art, and was a master of sketch art and oil painting, most often capturing the majesty of prairie landscapes accented with wildlife and subtle scenes of family life. Today, the best place to admire Mr. Redlin’s work is in the Redlin Art Center in Watertown, South Dakota. 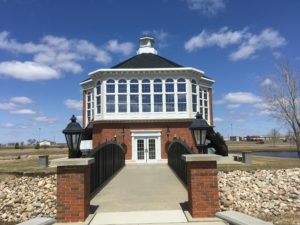 First opened in 1997, the center is presented as a gift to the State of South Dakota by the family of Mr. Redlin, and is an awe-inspiring tribute to the man and his art. 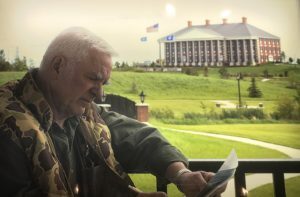 Terry Redlin with his art center. The entrance to the center is formidable and colonnaded, with a granite breeze way opening to an elegant welcome desk. At the welcome desk visitors can sign the guest book and receive information about the self-guided audio tour. This nifty system is based on mobile phones. To use it, simply dial 605-884-7101. As you come to various pieces, you can input item numbers which correspond, and a recording of Mr. Redlin describing the piece and the experiences which brought it about will play. Who better to lead such a tour than the artist himself? 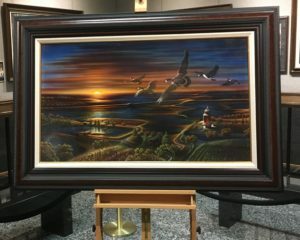 On special display during my recent visit was the previously un-released piece “Sunset”, part of a three-part series known as “The Farewell Collection” which Mr. Redlin was working on just prior to his passing. 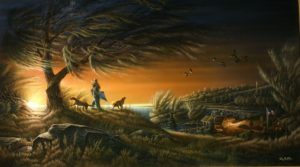 The piece has been presented on the second anniversary of Mr. Redlin’s death, and the third piece “After The Storm” will be released in April of 2019. 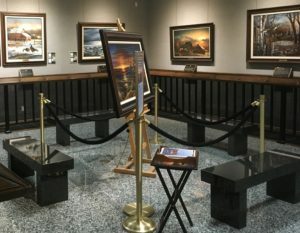 In addition to the beuatiful show rooms on three floors, a few gift shops can be found with everything from eyeglass cloths printed with Redlin art, to fine prints, and even wine inspired by the art! 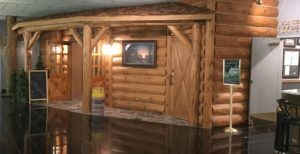 Cabin-themed gift shop on the bottom floor of the Redlin Art Center. 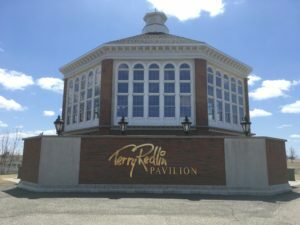 Once you’ve taken in the art on display, don’t forget to explore the exquisite grounds surrounding the center including the Redlin Pavilion. 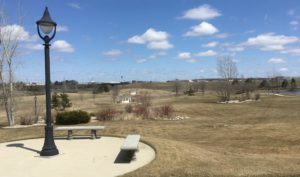 The landscape comprises the 30-acre Terry Redlin Conservation Park, and includes idyllic ponds dotted with Canada geese and quaint lanes for quiet strolls between gentle hills and graceful shade trees. It has been suggested that this was Mr. Redlin’s most enduring work: a living “painting” of prairie beauty. If you go, you’ll find the Redlin Art Center just off I-29 at the Watertown/Kranzburg exit 177 in Watertown, SD. The Center is open year-round M-F 9-5, Sat. 10-4, and Sun. 12-4. Admission is free. 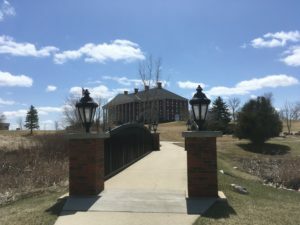 Be sure to tell them that you read about the center on PrairiePartyOfOne.com! He was really a good artist! Makes you wonder who it was that finished the sunset trio? This is Julie from the Redlin Art Center. Just for clarification, the trio of paintings mentioned are being shown unfinished…nobody has finished them. Thank you, JD, for your kind words and your visit! 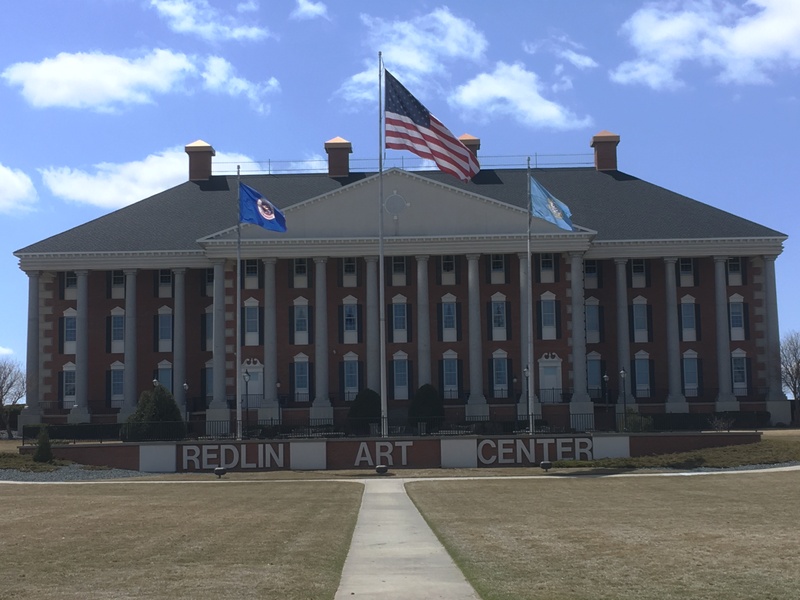 The Redlin Art Center is truly a special gift from Mr. Redlin to his hometown! Thank you, Julie! I had a most wonderful time there, and will surely be back! Yes, Diane, I especially like how birds in flight often feature in his work. Where there aren’t birds flying, there’s often wind or a breeze. I think the concept of movement was something that fascinated Mr. Redlin. My husband and I stopped here about two years ago on our way to Rochester. 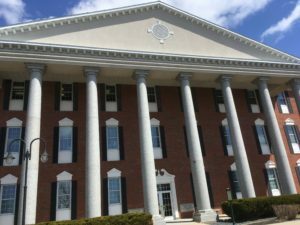 If I remember correctly, the design for this building was patterned after the Harland and Wolff Building in Belfast, Northern Ireland. They, of course, were the builders of the Titanic and her two sister ships.